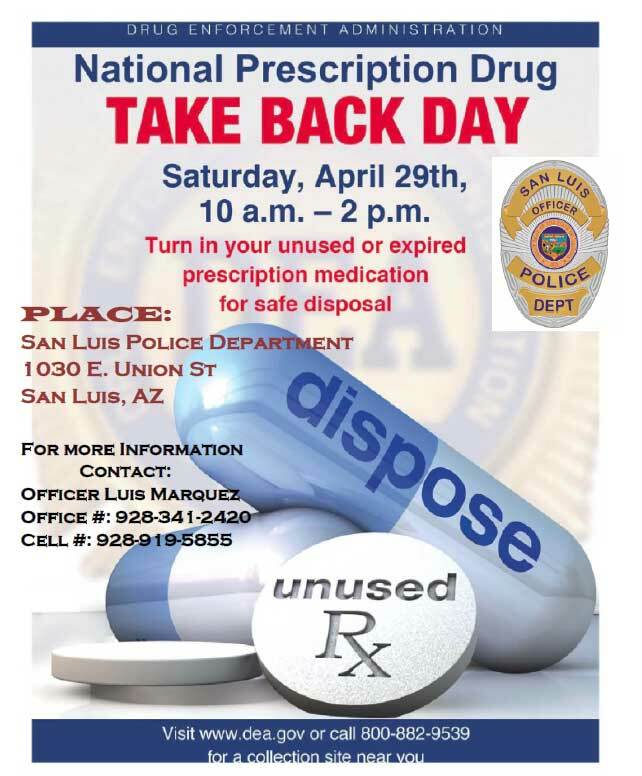 The San Luis Police Department in conjunction with D.E.A., is collecting unused or expired medication for safe disposal. Therefore, we continue to invite you, your family, and friends, to clean your medical cabinet of any unwanted, unused, or expired medication. The continued abuse of prescribed medication by our teenagers’ is an ongoing battle and we must help to prevent the misuse. Let’s do something about it! Join DEA and SLPD in support of this action on Saturday, April 29, 2017 from 10:00AM to 2:00PM at the San Luis Police Department’s parking lot. For any questions or more information please contact Officer Marquez at 928-919-5855.